Senate's Foreign Relations Committee holding consultations on imposing sanctions against individual Russians. The Foreign Relations Committee in the United States Senate is preparing legislation to provide support to Ukraine and consulting with the Obama administration on possible sanctions against individual Russians and Ukrainians cooperating with them, the committee's chairman said on Monday. "Russia's military intervention in Ukraine constitutes a clear violation of international law and demands a swift and coordinated response from the international community to support the Ukraine and counter Russian efforts to annex Ukrainian territory by force," Senator Robert Menendez, a New Jersey Democrat, said in a statement quoted by Reuters. The Senate panel is developing a legislative package, supported by both Democrats and Republicans, to authorize funds to provide at least $1 billion in loan guarantees to provide structural support to Ukraine's economy, he added. It would also authorize technical assistance for energy reforms and to provide election support, strengthen civil society, fight corruption and help Ukraine recover stolen assets. 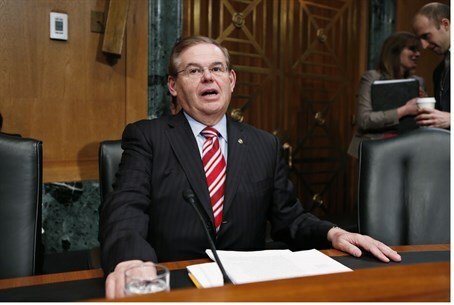 Menendez said the committee was also consulting with President Barack Obama's administration on possible sanctions against individuals ranging from visa bans and asset freezes to suspending military cooperation and sales, as well as economic sanctions. In recent days, Republican lawmakers have criticized Obama over his foreign policy which, they say, encouraged Russian President Vladimir Putin to deploy troops to Ukraine. In fact, Sen. John McCain (R-AZ) said Monday that events in Ukraine are directly related to Obama's “feckless” policies. Meanwhile, Russia told the UN Security Council on Monday that it was Ukraine's deposed president Viktor Yanukovych who formally asked Moscow to deploy Russian troops to re-establish law and order in his country, reported AFP. Russia's ambassador said Yanukovych sent the written request to President Vladimir Putin on Saturday, addressing the third round of emergency talks on Ukraine in New York in four days. Vitaly Churkin said what he called "radical extremists" had seized power in Ukraine and -- incited by Western powers -- were threatening the lives and legitimate interests of Russians. Churkin’s short address provoked stinging rebuke from the British, French and U.S. ambassadors who said Russia was fabricating excuses to justify its flagrant violations of international law. U.S. ambassador Samantha Power said Russia's claims had no basis in reality and that there was no evidence of violence against Russian or pro-Russian communities in Ukraine. "Russian military action is not a human rights protection mission. It is a violation of international law," she said, according to AFP. "Russian mobilization is a response to an imaginary threat... Military action cannot be justified on the basis of threats that haven't been made and aren't being carried out," Power added.